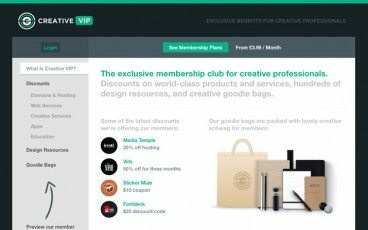 Creative VIP is a membership service we launched for designers and creatives in July. It’s been growing steadily, and I’d love to share some of the progress we made over the latter part of the year. We’ve added plenty of new partners, a slew of design resources, and sent out dozens of lovely creative goodie bags to our members. So join us as we recap some of what’s now on offer for the lovely creative folk we’re proud to call members. The main purpose of Creative VIP is to bring a selection of wonderful products and services to our members, at discounted rates you would never get elsewhere. It’s an exclusive community of people who want to save a packet on some cutting edge apps, services, and design tools. These are amazing companies, and we’re really pleased at how much of a saving our members are seeing with their $5.99/month membership! We also provide a great library of design resources for members ourselves. PSDs, vectors, web templates, CSS snippets, and lots more. Between July and December, we introduced an all-new way to find your way through everything (with great search), and added hundreds of new resources. Everything from icons and user interface kits, to WordPress themes and CSS widgets. I’m really pleased to see how this has kept growing, and it’s always exciting to see one of our resources pop up in real-life use when browsing around the web! When we kicked things off in July, we were only accepting payments in British Pounds. No problem if you’re based in the UK, but a little bit confusing if you’re based in one of the other 189 countries around the world! We’re pleased to now be accepting subscription payments in USD as well as GBP, so everything is a bit simpler for our international members. It’s been a pleasure getting to know our members better this year, and more clearly understand how we can shape the product into something you’ll get even more value from. Thanks to everyone who’s supported the project so far — either with a membership, or with your advice and suggestions. I’m excited to see where 2014 takes us! If you’re interested in becoming a member, it’s a fantastic way to start 2014 with some incredible discounts and savings.